“I declare war against the soldiers of the law of Jante. I want to graze among my fellow sheep. I want to sing for those who are excluded from the meadow of conformity. I want to fight for the right to be a speckled sheep and be acccepted for what I am”. So anyway, after our ears were hurting from the sound of waaaaaaaay too many repetitive beats we found a proper pearl. ‘What kind of magic is this?’ are the words that squeeze themselves, popping out in a Minnie Mouse squeak (and we mean that in a good way), from the quite breathtaking pipes of Stockholm’s Solblomma Hedin. What kind of magic indeed. Papageno With a growling thrum of backing tracking, think Depeche Mode booted out the back of a transit on a cold, dark winter’s night, think Lykke Li taken by the darkside, think Kylie with Winehouse’s problems, think Emilliana Torrini on 45, Bjork dating Goldie… oh, hang on… well, then we begin to see something remotely resembling Solblomma. She deserves better than Portuguese soaps though. What she does is quite quite quite quite the most brilliant thing we’ve heard all year. ‘Papageno’ stopped us dead in our tracks. It sounds utterly bonkers first time, and come to that it still sounds bonkers the second time too. What it does is leave you scrabbling for more. And the more is just as good. Not only does she sound like a star, she looks like one too…With eyes you could stand teacups on, she’s got something of the Cheryl Cole about her… only with a Katie Price makeover… at night… with doll’s clothes. Sounds original, check, looks original, check. You could file comfortably under the current 80s electro revival and no one would bat an eyelid. Best of all though, the whole thing has the sort of rough diamond feel that gets people like us all worked up. It’s all there, but it could do with a bit of spit and polish. Not the finished article, which is a good thing, but you just know when she does (and from where we’re sat, it is when rather than if) get a polish, well, blimey. Solblomma is emblematic of how one can picture an eccentric. At the same time as she is fighting for the right to be different, she fights for the right to be paradoxal. Behind the Minnie Mouse approach, the baby like voice and the ethereal fairy pop, that sounds like it was produced in a Hello Kitty-decorated girls room in Tokyo; there´s this determined philosopher with a political pathos, that refuses to be thrashed by norms, trends and a music industry filled with anxiety. “I walk my own path. It can be a bit lonely. I´m a speckled sheep, looking for my herd”. After two albums and four singles, under the name kiN, Solblomma now performs under her own name and releases the single “(Come Count The) Sheep (With Me)” this spring 2013. A SPECKLED SHEEP AMONG THE STRIPED/ Solblomma´s real name is Solblomma Hedin and grew up in Gävle in the 80s. As a child she wrote songs, built her own dolls and musical theatre plays. The family moved eventually to Bromma, in Stockholm, where she confronts a harsh reality. Being different is not considered cool, and to avoid being harrassed she often had to switch classes and schools. Solblomma finally enters musical high school at Södra Latin, where life takes a positive turn. BUSKER/ After high school, Solblomma travels alone all over Europe with her guitar. When finally coming back to Sweden, she starts arranging her own songs for piano and double bass. With that setup she is performing on different scenes, fairs and festivals in the Stockholm area. She experiments with the musical language and break the boundaries of the traditional song format. Her first tonal art performance “Flowers On A Rulling Hoop” is an epic composition in eight parts. STONED BJÖRK/ In 1997 she releases her scholarship subsidized debut album “SARA”, at Slask Records. STRAWBERRY ARMY/ The following years Solblomma is developing the tonal expression. With her band Strawberry Army, she creates experimental death metal with theatrical elements. Dummies, christmas trees and rubber ducks are parts of the symphonic hard rock landscape and Solblomma is hovering above it all like an inexplicable entity, taken out of Twin Peaks. Kissing my Wardrobe Sara & Strawberry Army are doing several shows at Stockholm clubs and festivals. The year 2000 the band splits due to internal quarrels. To Solblomma it is obvious that the music industry and their supporters are content with being held in the Palace of the law of Jante. EMI/ Solblomma decides to appear in a new “costume”. She tries to adapt her artistry in a way that anyone could understand. Her expression is held back, her voice is held back in the mix and the key is lowered. Managers, producers, publishers; all have their saying. Solblomma feels uncomfortable and weakened. The result of the recording sessions are exactly what the people around her want and the format is supposed to make her “different” in a controlled and predictable way, which makes everybody in the music industry wanting her. Angel In the year 2000 she signs with EMI Capitol Sweden. At the same time one of her songs is played in the costly film production “Eve and Adam”. The EMI tale is not a beautiful one however. The contract is being terminated when a new chairman is showing up after the company is restructuring but Solblomma is not too sad about what happened. She felt it was a dead end anyway and doesn´t want to be one of the many out there. She wants to be a passionate creator, a free artistic spirit. FOLK SONGS AND ELECTRONICS/ In the aftermaths of the darkness, Solblomma goes on with her interpretations of swedish folk songs. Flickan Under Nymånen The swedish folk tone has always been the foundation of her compositions – the source Solblomma returns to when the world feels like a cold and lonely place. Well known folk songs are given an electronic make up and her fragile voice can roam freely over an urban soundscape. A minor record label wants to sign the album but Solblommas chooses another way. She temporarily abandons the folk songs and begins the work with an english spoken album with producer Håkan Folkesson. KIN & MANGAPOP/ In the recording studio, the days of big compromises are over. Solblomma and Håkan Folkesson find a format within which the work can progress. They want to follow the rules of pop music without intruding on the uniqueness of Solblomma´s expression. The record companies like Solblomma… but could she possibly be too special for a normative country like Sweden? In the spring of 2004 she encounters a record company that looks beyond the swedish borders and appreciate her for what she is. She sign with the company but unfortunately they soon go bankrupt. Once again the dreams are shattered. BLOMKRAFT RECORDS/ THE ZOMBIC HUNCH/ Solblomma is fed up with the skittish music industry. She is tired of waiting for a train that never intends to arrive. She is tired of mediocrity and the soldiers of the law of Jante. She wants to escape the sheeps meadow. Solblomma realises that she must take the matter into her own hands and stop begging outside the doors of the big companies with their arbitrary directives. Memoria She creates her own record company – Blomkraft Records and in the spring of 2005 she releases the album “The Zombic Hunch” under the name kiN, that means sun in mayan language. The album receives lots of attention. 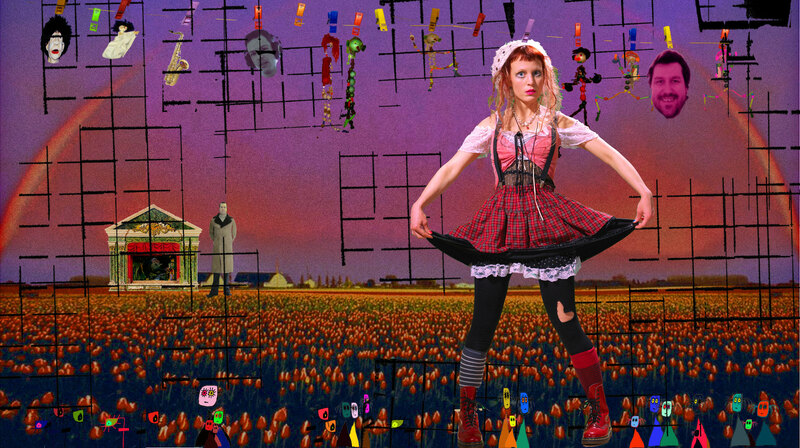 The critics are amazed by the Pippi Longstockings-figure with the helium voice in some kind of electric space-pop. China Café One critic becomes euphoric like some old revolutionary german in the Vatican. Another asks what planet she comes from – and if he knew he would travel there immediately. The single records “Angel”, “Girl At The Station and “Sandman” are being played frequently at radio P4, various local stations, Studentradion and Radio Stockholm. Solblomma and her new band Rubber Duck Army play on national TV, several Stockholm clubs and go on tour on summer festivals. The Sandman video is frequently played on MTV Alternative Nation. It is also a leading theme in the immensely popular tv series for youths in Portugal – “Morangos com Açúcar”. It becomes a huge hit in the latin world. Subsequently she is being introduced to new producers, songwriters and musicians. She begins a cooperation with the song writer and band member of Secret Service, Tim Norell and through Ten Music Groups she gets in touch with Ola Håkansson, Pete Davis, Sweden Songs, Antiloop and many more. It results in new songs and experiences. THOSE BOMBS WERE MADE FOR US/ The saxophone player and jazz musician Michael Adkins from New York hears SoLBLoMMa´s music and gets inspired. He travels twice to Sweden to record and work on songs that will later come out on the album “Those Bombs Were made For Us”. In 2010 the album is being released on iTunes. All of which is leading up to present day. BRIC-A-BRAC/ Besides the music Solblomma has during several years been working as a puppet master in the theatre group Commedia Gillet. She has also worked with mask theatre, commedia de´ll arte and clownery. She is doing her own clown character, the Clown Solblomma, who is doing performances at birthday parties and other events. She cooperated with the jazz piano player and composer Joakim Simonsson and created a philosophical childrens album and toured with the band Sara Solblomma & Ruskigt Bra-orkestern! backed up by Länsmusiken. När du finns Furthermore, she has written books about trains for children, scripts for the theatre stage and studied history, theatre science and theoretical philosophy at the University. In June 2017, her Sol-IQ and Sol-IQ Kids were launched, which are two unique APPs consisting of logical patterns with flaws that are intended to be completed. Solblomma made her album debut 1997 under the name Sara with an auditory spectacle of experimental trip hop spirit of the new Messiah. She´s been doing theatrical death metal, electronic folk song interpretations and avant garde techno. Furthermore, she´s been signed by major record labels like EMI and Bonnier, received scholarships, travelled around in Europe as a street performer, written music for a Swedish Film industry-movie, had a leading score in a Portugese tv-series, and has thrown rubber ducks over her audiences. On her own record label Blomkraft Records she has released two albums and four singles under the artist name kiN, among them the MTV hit “Sandman”. Her music has been described as quirky-electric space pop with some post punk ingredients and she has been compared with artists like Kate Bush, Diamanda Galás, Björk and Kylie Minogue. In the spring of 2013 she releases the first single “(Come Count The) Sheep (With Me)” under her own name, Solblomma.